Continue to read through this guide to answer the above questions and identify the best type of machine for you. A rotary mower rotates about a vertical axis with the blade spinning at high speed, relying on impact to cut the grass. A rotary mower generally has one blade that rotates horizontally. The blade features leading edges that are slightly curved up to generate a continuous air flow as the blade rotates, therefore creating a sucking and tearing action. Most rotary mowers are powered by petrol, mains electricity or, increasingly, by battery. Cylinder lawn mowers offer a very low, very fine cut for a traditional striped lawn. 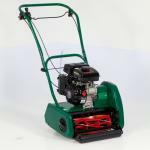 They are available in both petrol and electric and to suit all needs and garden types. Ideally suited to the gardens where a fine finish is important, our range is suitable for all size gardens, from small ones to bowling and cricket greens. 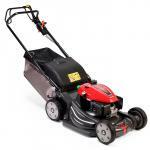 If you are looking for fine finish for an informal lawn a 4 wheeled rotary mower would suit you perfectly. However please see below if you have borders, flower beds & edges. If you have a lot of Borders, Flower Beds & Edges we would recommend getting a rear roller mower this would allow you to mow right up to the edge without worrying about the wheels dropping off the edge of the border and scalping the lawn. To get the traditional defined stripe a rear roller mower would be ideal. In addition to achieving a classic stripe rear rollers can give you a helping hand if your lawn suffers from clumps or worm casts, fundamentally ironing out the imperfections. To help choose your mower you need to know whether you are happy to push your machine or would like some assistance. There are standard push propelled machines but also self-propelled ones, with single speed, variable speed & hydrostatic drive.